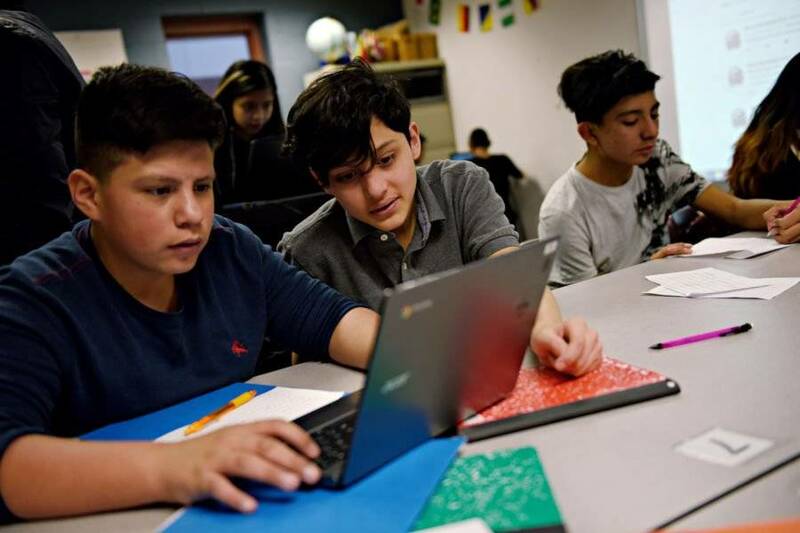 Alejandro Moya, left, and Salvador Garcia look at tweets together that students were adding to a Google Doc as drafts before tweeting them out. Students from Bruce Randolph School tweeted messages to President Donald Trump on Wednesday. Spread out over large tables, the students of Room 228 cluster together in front of their laptops, typing out messages to the president of the United States. The sixth and seventh graders at Bruce Randolph School in northeast Denver are the sons and daughters of immigrants. For almost a week now, they have been learning in their English language development class about the contributions of immigrants, President Donald Trump’s rise to power and the vocabulary behind his favorite mode of communication: Twitter. Those lessons culminated Wednesday when the students’ messages to the president about how their friends and families make America great were posted on the social network via a new classroom account. Trump’s election and hard-line executive orders on immigration have stoked fears in immigrant communities in Denver and across the country about raids and mass deportations. With so many children of immigrants enrolled in public schools, the classroom has become a forum to meet those fears head on, with educators providing moral support and teaching moments. This week’s classroom exercise at Bruce Randolph began with a challenge. Principal Cesar Cedillo and another school administrator are headed to a conference in Washington, D.C., this month and arranged meetings with members of Colorado’s congressional delegation. Teachers were asked to come up with an assignment that would produce something the school leaders could take to the nation’s capital to share with the delegation. Last week, the students watched the film “A Day Without a Mexican,” which takes a satirical look at what would happen if all of California’s Mexicans suddenly disappeared. They watched a short PBS “Frontline” piece about Trump’s ascendancy. And they learned the language of Twitter — character counts, how to tweet at people, how hashtags work. The students spent part of Monday writing drafts of their messages, and refined them Tuesday. Although Rees said the main point of the assignment is to tell students, “You’re important, your voice matters, and it doesn’t feel like that right now,” it’s also a reading and writing exercise. More than seven in 10 middle school students and nearly eight in 10 high school students at Bruce Randolph are English language learners. Some of the sixth and seventh graders in Rees’s classroom are reading in English at second- or even first-grade level. Many of the students’ parents and relatives are undocumented. During third period Wednesday morning, students in Room 228 type their 140-character-or-less messages into a shared Google Doc. One of the two teachers — Rees or Carrie Cisneros — checks them for accuracy and moves them to Twitter, at times tagging Trump’s Twitter handle. My immigrant family makes America great because they work and pay taxes. My mom helps make America great by being an honest citizen. @realDonaldTrumpMy mom is an immigrant and she takes care of me and my sibilings #MYmomisawesome! The tweets — which Rees plans to compile so school leaders can take hard copies to Washington — come in rapid fire. The students summon the teachers for help with calls of, “Miss, miss.” One boy asks whether it’s possible to use a burrito emoji. The students were told to keep it positive on Twitter, Rees says, not be mean like Trump can be. “Don’t forget to capitalize ‘America,’ friends,” Cisneros says. Immigrants are as equal as anyone else. So are Muslims. We should be able to live anywhere we want without being mistreated. Eating lunch in class after the period ends, a group of sixth-grade boys share their feelings about President Trump, immigrants’ role in society and the assignment they’ve just completed. The boys say they hope their messages, whether Trump sees them or not, make a difference in how people think and act. They hope no immigrants are deported, or hurt. How does it feel to share their experiences with the president?